In the January 1964 newsletter for Valley Federal Savings - Principals and Interests (for Valley Fed. employees) this photograph of the company's softball team was featured. 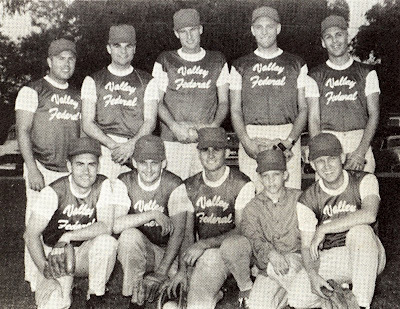 "Returning to the softball line-up this year are (left to right) front row: Lynn Bird, Don Headlund, Art Aston Jr., Ken Brock, bat boy, and Forrest Geary. Back row: Ron Anderson, Steve Falk, Rick Needham, John Green and Chuck White. Many additions to the team are also expected."